Polish! Aluminum Tank heads, Stainless Steel Tank heads and Copper Tank heads - Wisconsin Stainless Heads Mfg. Inc.
As I was walking through the production area this morning I saw an interesting sight. Three different materials, all polished, all right next to each other. This shows exactly what our polishing department can do in three different mediums. Aluminum Tank heads can get a brite finish or as you see on the left what we call a Brite Re-buffed finish. 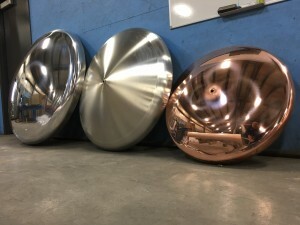 Stainless Steel Tank heads can have several different finishes. Pictured in the center is a #4 rotary finish. Â Stainless Steel Tank heads can also get the Brite Re-buffed finish for the mirror look if needed. Copper Tank heads are either Brite Re-buffed as pictured or left mill and then left to oxidize and turn green. We are very proud of our polishing dept. Thank you!